Seattle is certainly famous for its coffee culture, but any foodie knows that this city is also a paradise for anyone who’s passionate about Pacific Northwest cuisine, regional produce and showcasing local chefs’ talent! So, forget about coffee for a few hours and eat your way around the city instead. Begin at Seattle’s most beloved landmark, Pike Place Market where you can taste produce direct from the farmers, bakers, butchers, winemakers and chefs who bring their specialities to the market. Then explore more of Downtown Seattle’s food scene as you try some locally brewed craft beer, indulge in some chocolate at a speciality kitchen and stop by a bakery for desert! Join a local who’s a passionate foodie, and will share the secrets of the local food scene with you as you eat your way around Downtown Seattle. Let your local take you off the beaten path to some lesser known (but equally delicious) spots where you can relax and escape the tourist’s hustle and bustle. Begin your experience in Pike Place Market, the heart of Seattle’s foodie scene. This historic landmark is where you’ll be able to taste local specialities, regional produce and traditional Pacific Northwest dishes direct from the farmers, bakers, butchers, winemakers and chefs who have produced it! 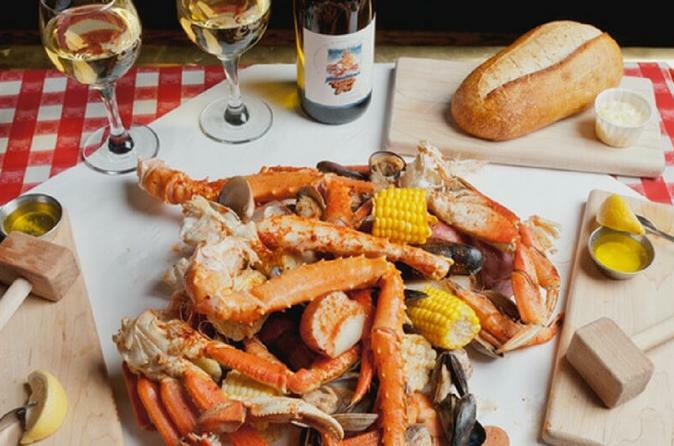 You’ll soon see why seafood is such an important part of Seattle’s food culture as you taste fresh oysters (raw or fried), clam chowder which has been voted the best in the country, chef Tom Douglas's signature salmon burger or crab cakes, and Dungeness crab. But the market doesn’t only specialise in seafood - taste locally made cheese and the most indulgent mac n’ cheese you’ve ever had, melt in the mouth salted caramel, traditional hot donuts lavishly dusted with sugar and cinnamon and real Italian gelato, all made with regional and sustainably sourced ingredients! As you stroll though the market, your local will share with you some insider secrets and you’ll discover how this market became such an important place for locals and farmers alike. Of course, you could stop by the original Starbucks Cafe or indulge in Seattle’s other speciality brew - craft beer! Head to the Seattle Brew Co. or the Old Stove Brewing Co., where you can sample some craft beers, real ales and unique larger, accompanied by a delicious bite to eat like fried oysters.